Rumble in the Bay was created in 2007. For the past six years (2012-2017) Bigfork’s Rumble in the Bay Car Show has been proudly owned and operated by the Veterans at Bigfork VFW Post 4042. In 2016, Rumble in the Bay brought in record-breaking crowds due to My Classic Car with Dennis Gage coming to town to film an episode of his show named after our show. Rumble in the Bay is one of the most eagerly awaited car shows of the summer in the Pacific Northwest. 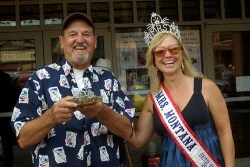 We’re located in Bigfork, Montana on Flathead Lake, a beautiful village on the bay. 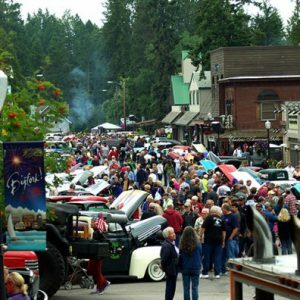 Bigfork closes off its main street, Electric Avenue, for the annual Rumble in the Bay Car Show. Participants from near and far roll into town with their beautiful vehicles. Crowds arrive in the early morning hours for food, drinks, and a relaxing stroll through town to enjoy and appreciate the vintages cars, trucks, and motorcycles on display. For more information on Bigfork Rumble in the Bay 2018, contact us at bigforkrumble@gmail.com or call Jesse Gonzales at (406) 260.8385. To register your vintage vehicle you can download and print a PDF entry form, 2019 Registration Form, or visit our online Registration page for our online registration with PayPal. If you do not pay with PayPal, we will contact you for payment. Registration cannot be confirmed until we receive your payment. You can also request a registration form sent to you via email or US Postal Service. The Veterans of Bigfork VFW Post 4042 are looking forward to seeing you and your car at the 11th Annual Rumble in the Bay on Sunday, September 2, 2018.